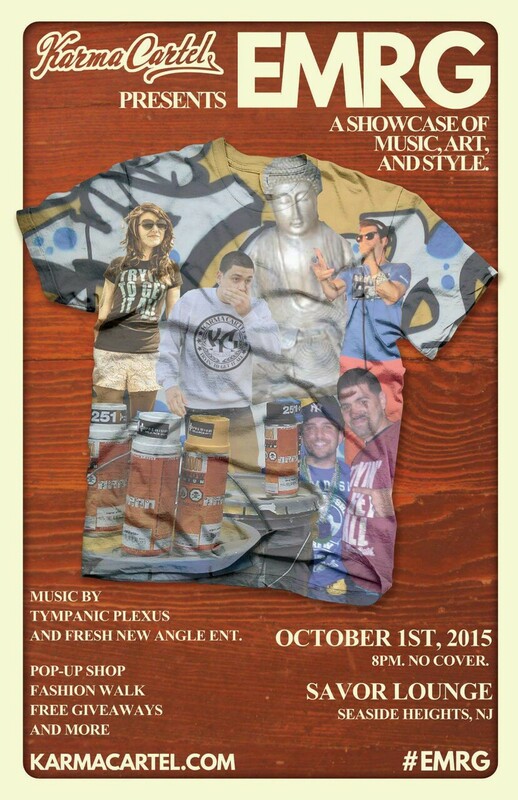 On October 1st, we are ecstatic to bring you EMRG, another night of art, music, and style! It’s been three years since we put together together Karmageddon, that party at The Mansion in Brick that had a break dance battle, live graffiti demos, and special guest Master Gee from Sugar Hill Gang. Remember? Yeah we did that. And we’re back. There will be free giveaways. There will be more live art by scene legend Dogmatic. There will be live music by the instrumental titans Tympanic Plexus. There will be DJs spinning throughout the night, courtesy of Fresh New Angle. We are bringing back the official KC PopUp Shop. And there will be… the first ever… Karma Cartel FASHION WALK! This, by the way, is all free to get into. Yes, free. We super psyched about this, and we hope you all come join us. Thursday, October 1st, at incredible Savor Lounge. Prepare yourself to EMRG.